As the Free Thought Project reported, voter suppression in Maricopa County, and the rest of Arizona ran rampant last month during the primary. The number of polling locations was drastically reduced, leaving many voters with a wait time of 5 hours just to vote. Others were left with no voting locations at all. The election rigging was so obvious that a hearing was held the following week in the House Gallery to discuss possible courses of action to correct it. On Monday, during the hearing on the election challenge, a Maricopa County poll worker testified the computer system she used to check in voters would not allow her to give the correct ballots to voters. The testimony from Dianne Post confirmed the rampant voter suppression and election rigging which led to the hearing taking place. Post, who is an attorney in Maricopa County, testified that a machine she was using to check in voters at a location failed to give 36 people the proper ballot. According to Post, another 22 people at her location were listed in the wrong party and their polling place ran out of ballots for at least two congressional districts. “Every single time it happened to me it was a Democratic voter who wasn’t able to access a Democratic ballot,” she said. Post was only one person in one station, the allegations of suppression spread throughout the state. Post’s testimony was backed up by Alisa Wolfe, a resident of Pima County, who testified her voter registration was improperly changed from Democrat to independent, according to the AP. According to Wolfe, when she alerted the Pima County Recorder’s Office of the problem, they told her it was due to a computer glitch. The Democratic Party, Bernie Sanders, and ironically Hillary Clinton, who was the main beneficiary of the computer glitches and voter suppression, are suing the state citing the “alarmingly inadequate number of voting centers resulted in severe, inexcusable burdens on voters countywide, as well as the ultimate disenfranchisement of untold numbers of voters who were unable or unwilling to wait in intolerably long lines,” according to the lawsuit. In 2012, Maricopa County had 200 polling locations open on primary day, but reduced the number of polling stations to only 60 for 2016. The extreme reduction of polling locations served to create wait times of over 5 hours to cast a ballot; an extreme amount of time that working class citizens often don’t have the luxury of waiting. 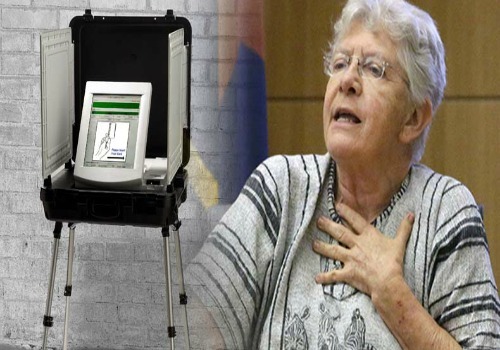 Maricopa County Recorder Helen Purcell who was responsible for the reduction in polling places in 2016, attempted to justify her actions by claiming that voter turnout was traditionally low, so she simply reduced the number of polling locations to save money. However, she was either lying or grossly incompetent as the number of voters had more than doubled from 300,000 in 2012, to 800,000 in 2016. According to the AP, Tucson resident John Brakey sued Arizona Secretary of State Michele Reagan and all 15 counties after the election. He contends long lines in Maricopa County suppressed the vote and statewide voter registrations problems led to illegal vote counts. He wants the results decertified, however, according to the attorney general, the results can’t even be challenged and Brakey can’t show the results would change if the contest was allowed. Since this massive effort to suppress voting, the U.S. Department of Justice has launched an inquiry. The Free Though Project would like to recommend not holding your breath to await the results of said inquiry. The fraud has gotten so rampant that a C-SPAN video even caught it. Clinton’s ‘victory’ would have nothing to do with ‘luck,’ and her premature declaration of the “razor thin” tie, was no mistake. Contributed by The Free Thought Project of The Free Thought Project.